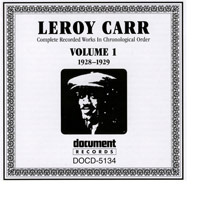 How Long, How Long Blues was the first recording by the young team of pianist/singer Leroy Carr and guitarist Scrapper Blackwell. The 1928 outing was not only a big hit — it made Carr a star for the next, and last, 7 years of his short life — but an early influence on the urban blues that was just then taking shape as Southern rural blues artists made their way to places like the duo's home base of Indianapolis. As you will hear on the audio clip of that recording below, Carr's vocals and piano playing are understated, as are Blackwell's single note riffs. It isn't hard to hear its appeal to sophisticated urban audiences of the 1920's, not to mention guitarists looking for a great tune to jam on decades later! 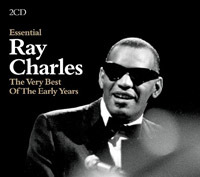 Twenty years after that hit recording, How Long was covered by another up and coming pianist/vocalist, Ray Charles, who exemplifies in many respects the urbane black artist that Carr is credited with influencing. You can hear that influence clearly in this clip of Charles' 1949 performance. The combo and arrangement are more fleshed out than that of Carr and Blackwell, but at the core you still have "cool" piano and vocal with bluesy guitar obliggatos — provided now on electric guitar by a busy sideman named Mitchell 'Tiny' Webb. You may notice as we go along that all the versions of this song surveyed here have slightly different chord progressions. Listen for the I-VI-ii-V that Charles uses for bars 5/6. Try it! 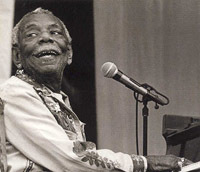 "Urbane" and "sophisticated" are not the first adjectives generally applied to pianist Champion Jack Dupree (shown right). Look for the words "raucus" or just plain "fun" instead. This track provides a taste of why that might be the case, as our cool blues gets transformed into a barrelhouse romp. That said, we're still in the realm of arrangements that feature piano/vocal with guitar fills. Stepping away from the keys and toward the strings, there's this popular fingerstyle guitar version by Jorma Kaukonen of Hot Tuna. This was my intoduction to the song back in the 1970's. Jorma lays it down with a nice slow groove in the key of D. Notice that where we play an Ab he uses a G# diminished chord, moving up chromatically from the IV7 chord (which, for him, is a G7). Figure out what that would give us in the key of C and try it out. Speaking of that Ab chord, here's the Doc Watson arrangement that inspired its use. 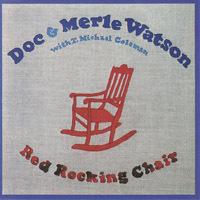 It's on a 1981 Flying Fish release with his son Merle, Red Rocking Chair. The track also features Charlie Musselwhite on harmonica. They are playing the tune in the same key as we are and, as noted, we've more or less lifted Doc's chord progression, so if you are in the market for a little ear training and also want to pinch the solo, jump on it!